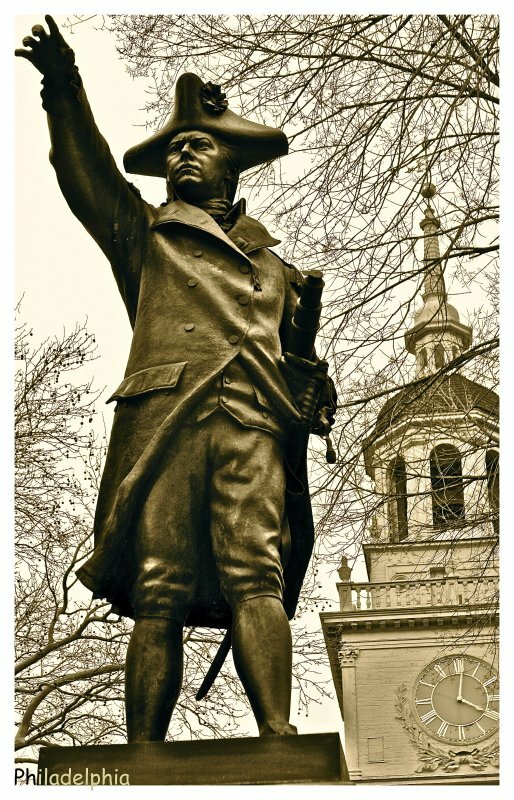 Meet Philadelphia's Irish-born naval commander, Commodore John Barry. Barry was born in a modest thatched cottage in 1745 at Ballysampson on Our Lady's Island, which is part of Tacumshin Parish in County Wexford, Ireland. In the space of 58 years, this son of a poor Irish farmer rose from humble cabin boy to senior commander of the entire United States fleet. Intrepid in battle, he was humane to his men as well as adversaries and prisoners. Barry's war contributions are unparalleled: he was the first to capture a British war vessel on the high seas; he captured two British ships after being severely wounded in a ferocious sea battle; he quelled three mutinies; he fought on land at the Battles of Trenton and Princeton; he captured over 20 ships including an armed British schooner in the lower Delaware; he authored a Signal Book which established a set of signals used for effective communication between ships; and he fought the last naval battle of the American Revolution aboard the frigate Alliance in 1783. Nice shot. Love the tone.V. Lovely tone and a great capture. Thank you so much for the info Steph! Noy quite was I was expecting from your intor but a wonderful shot... works well in sepia and thanks for the history too! Great shot and very nice toning. A great shot, Steph! I like the narrative, you know me... the history buff. Very strong image, highlighted by the perspective and your processing. Completes it very well..
Super angle to show the determination and heroism of this man. Hi John! lovely shot and story! Love it! Almost posted a statue today. I like it.....you did good, girl! Cool shot looking up like this, with very nice details. Not a lot of people know about Barry. If you're ever in DC you can see the destroyer USS Barry at the Washington Naval Yard. A man who loved the smell of the sea. nice find and shot..interesting history also Stephanie.. They weren't strong on colors in those days, just on liberty! Great work pairing the statue with the clock tower. Thanks for the history lesson, too! Really like the post processing here... well done. Jv V! Excellent capture of the statue & complimentary background! Powerful shot,looks good in these tones. Powerful shot of a powerful man. And you learn something every day, thanks for sharing both words and pictures.